In Indonesia, the number of Javan rhinos are considered critical with only about less than 55 rhinos left. With this in mind, Redspace, together with AR&Co, engaged in a corporate social responsibility project to address this issue. It aims to help animals in Indonesia from extinction and hunger, starting from rhinos through the use of innovative technologies. As the project is equipped with digital innovation, the challenge here is to create a simple user experience from design to mechanism. Since this is the first mobile application in the world that can donate to WWF with augmented reality, technical issues became a challenge as well. In order to attract people to this project, an augmented game development was developed. Redspace also teamed up with WWF Indonesia and Bank Mandiri as partners. Mandiri e-cash became the online payment gateway for this project and WWF Indonesia helped providing details about the animals’ situation and managing all donations from this project. 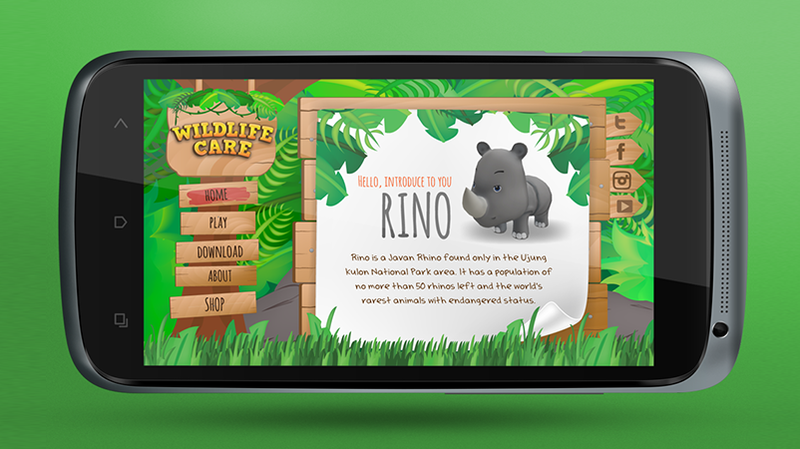 The mechanism for this game is simple, with registering to Mandiri e-cash and by directing their phone towards Mandiri’s ATM card, an adorable rhino will appear. When they donate a certain amount, the Rhinos will be provided with food, medicine and other treatments. In a way, it implies that every donations made will be able to save more rhinos in Indonesia and allows them to live the life they deserve.